Since 2005, Glenn has portrayed famed sculptor Frederic Auguste Bartholdi, designer of the Statue of Liberty, on location at Liberty Island. 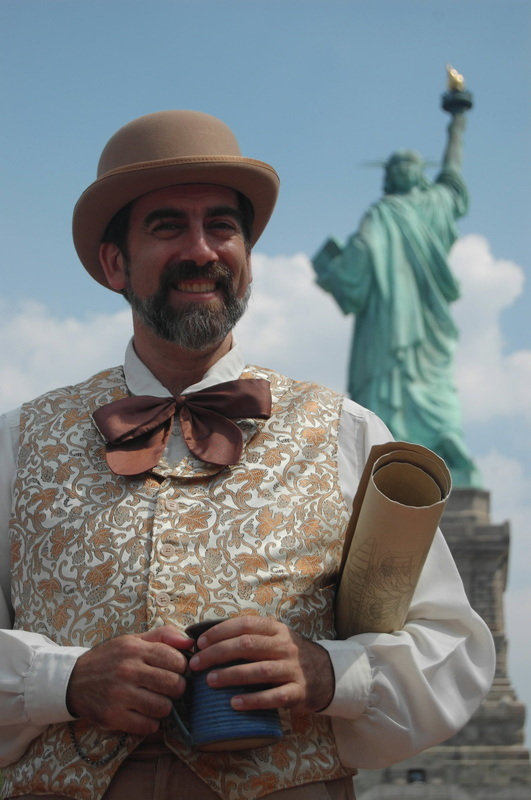 He has entertained visitors from all over the world, regaling them with stories of Bartholdi's life and the creation of the statue formally known as Liberty Enlightening the World. This interactive show is based on scrupulous research including Bartholdi's writings as well as a trip in 2007 where Glenn traveled to Paris and Colmar, Bartholdi's birthplace and home. In December 2008, his work on Liberty Island was featured on Air America Media's Maron v. Seder in a series of interviews with Marc Maron(see links below). He is available for personal appearances at parties, gatherings, and school visits. Rates are available upon email request(click on tiny envelope in the upper right or lower left hand corner of this page).